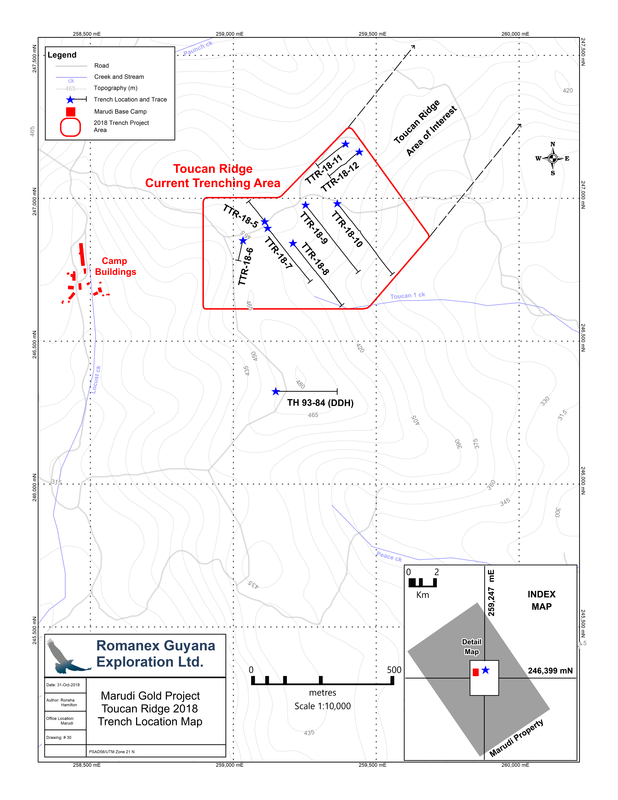 November 13, 2018 / TheNewswire / Vancouver, Canada - Guyana Goldstrike Inc. (the "Company" or "Guyana Goldstrike") (TSXV: GYA, OTC: GYNAF, FSE:1ZT) is pleased to report assay results from Trench TTR-18-07 at the Toucan Ridge area on its Marudi Gold Project ("Marudi" or the "Property") located in the Guiana Gold Belt, Guyana, South America. TTR-18-07 was trenched for a total length of 243.30 metres and successfully exposed the quartzite-metachert (host rock) in place. 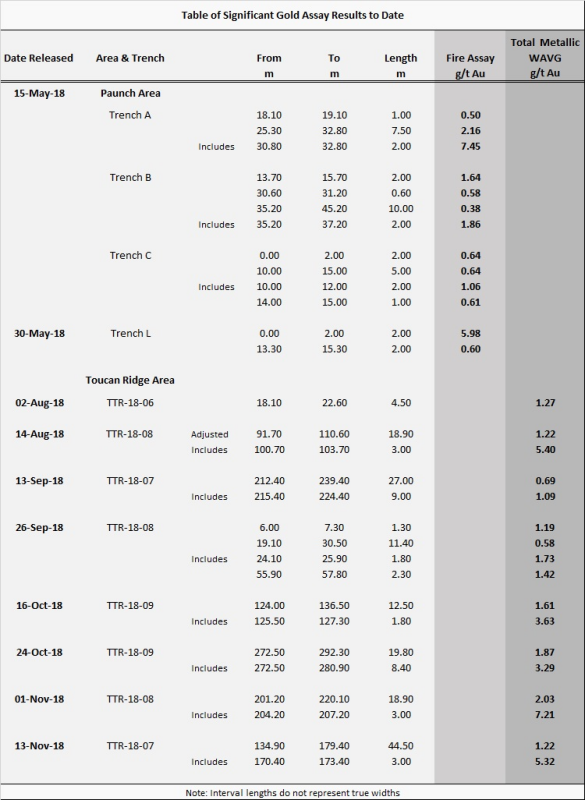 Assay results are from samples taken in hard and slightly weathered host rock returning values of 5.32 g/t Au over 3.00 metres, within 44.50 metres of 1.22 g/t Au. These represent the final assays from TTR-18-07. Additional assays are pending from trenches TTR-18-10, TTR-18-11 and TTR-18-12 and will be released once received and reviewed by the Company. The technical team continues to trench along Toucan Ridge progressing in an eastward direction with a total of 1,885 metres trenched and 575 samples taken. The area of interest continues for more than 1.75 kilometres to the east of trench TTR-18-06. To date, a total of 8 trenches have been completed within the area of interest. Trench sites are planned where quartzite-metachert is exposed or interpreted to occur beneath the transported overburden.